I spotted this textbook trend retracement play on EUR/AUD, which lines up neatly with my bearish euro forex bias so I decided to short at market! What do you think of this setup? As you can see from the pair’s 1-hour forex chart below, a descending trend line can be drawn to connect the latest highs of price action, with the 61.8% Fib coinciding with an area of interest at the 1.5550 minor psychological mark. I was able to short right there, setting my stop just past the recent swing high. I’ve been euro bearish ever since ECB head Draghi admitted that they’re weighing their options when it comes to additional policy easing, even more so when economic data from the region turned out dismal. Yesterday’s downbeat quarterly CPI report from Australia was able to spur a much-needed correction from the sharp selloff, allowing me to catch an entry right around the descending trend line. Although the Australian economy is battling with its own economic troubles, I think the ECB is more likely to ease before the RBA does. After all, RBA policymakers sounded less dovish than usual based on their previous policy meeting minutes, as they removed the phrase indicating that they’re keeping an accommodative stance. Of course I’ll still be keeping close tabs on the Australian central bank’s upcoming rate decision to decide if I should be exiting this short forex trade early or not. If price action continues to go my way, I’ll be ready to move my stop to entry once the pair reaches the previous lows. If data from the euro zone continues to disappoint while the RBA maintains their relatively neutral policy bias, I’ll consider adding to my position on a break of those lows. 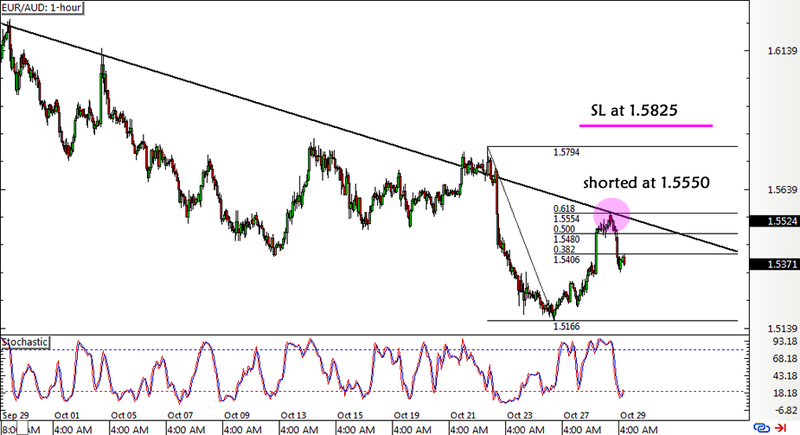 Short EUR/AUD at 1.5550, SL at 1.5825, initial PT at 1.5170, 0.5% risk. If you’re gonna join me, make sure you read our risk disclosure first! As I’ve mentioned in my quarterly forex performance review, I wanna be more gutsy when it comes to taking valid trade setups. My win ratio and expectancy metrics aren’t so bad so I’m gonna stop second-guessing myself!